Cod Hole, as the name suggests, is a dive site famous for cod; giant Queensland grouper to be exact. What makes this site special is that the giant potato cod are virtually domesticated thanks to 2 decades of being fed by divemasters. There's something special about a 60 kg fish swimming right up to you for a nibble from your hand. During feeding time everyone joins the action as coral trout, sweetlips, triggerfish and trevally also try to muscle in on the action. One of the most famous Great Barrier Reef dive sites, Cod Hole is a spectacle to behold. Steve's Bommie is a bit of a legendary site too. The ballad of Steve varies according to who's telling the story, but the common thread is that Steve loved this bommie, came to an untimely end and had the bommie named for him. A memorial plaque can be seen at 25m where most scuba divers start on this site. Legends aside, Steve's Bommie features a wealth of schooling action, big fish and macro life. Cruising barracudas, whitetip reef sharks and possibly even minke whales will leave you wanting to look everywhere at once. The Temple of Doom is another peculiarly named Ribbon Reef site. Aside from macro action on the bommie itself, pelagic fish are a constant and you'll have to ration your time between the reef and the blue. Shark sightings are common as are large rays and bluefin trevally of the 70 cm plus variety. Starting at a mere 5m below, the top of the reef runs with a gentle slope down towards a sandy bottom at about 20m. Several bommies dot the landscape, which are interesting in itself, although the main reef wall is the focus of your dive. 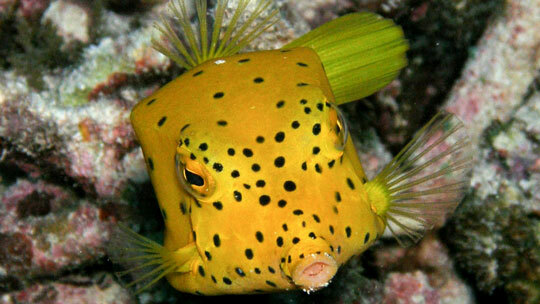 On your dive you can expect to see the very photogenic clown triggerfish, barracuda, red bass, sweetlips and huge schools of giant trevally. Challenger Bay also offers you an opportunity for very popular night dives. 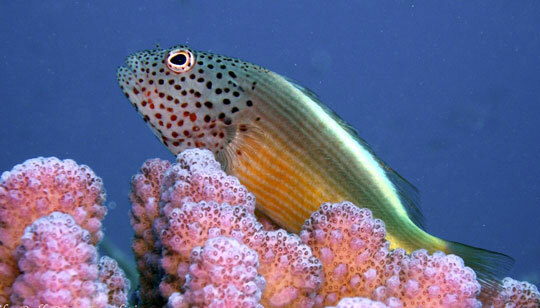 Over the years predatory fish have come to associate liveaboard engines and divers with an easy to find dinner. Schools of red bass featuring fish on average half a metre in length, and giant trevally at up to 1.7m each, are the prime offenders when it comes to this "crime of opportunity". During the night dive, the moment you shine your torch on a particularly interesting subject, perhaps a small fish, it disappears in the blink of an eye as a trevally or red bass zooms in to turn the brightly lit fish into an easy dinner. The entertainment value of 'targeting' the next tidbit for a marauding trevally quickly wears off. With a little care you can still see all of the marine life without putting them in the spotlight, and consequently on the menu. Night dives at Challenger Bay offers you plenty of other action though, and you will see lion fish hunting, large marbled moray eels, pufferfish and parrotfish in their mucus sacks. You'll also find loads of macro action as you explore the nooks and crannies of the reef, with banded cleaner shrimps and colourful nudibranchs dotting the coral. You may see some that you have not seen before which will send you scurrying to your boat's marine library to identify the likes of Robo's Chromodoris or Gabriel's Tambja. Care must be taken since there are some unruly tangles of staghorn which you could easily swim into when scouring the sea bed or if you've been marvelling at something like a burrowing sea cucumber. 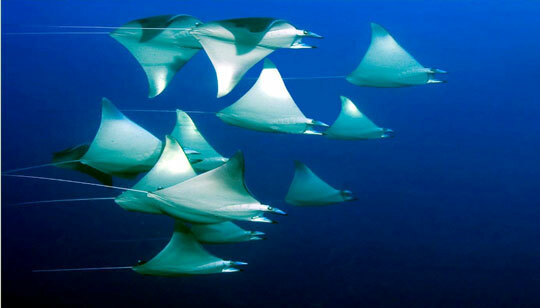 On your ascent back to the dive boat, look out for schools of batfish, up to about 20 in number, which can keep you company on your safety stop. As the name would suggest, clams are the main attraction here and you will have no trouble spotting them. Some of the clams grow up to 2m in length and can take over 150 years to reach that size. It is quite humbling to think that these creatures have such longevity and really can make you think about your place in the great order of things. 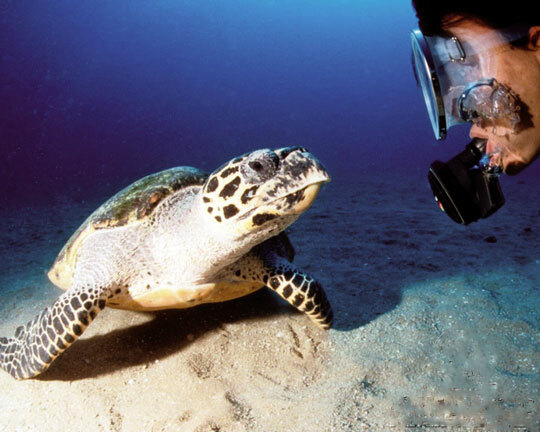 Scuba diving is not just about seeing pretty colours! If you wish to snap out of such deep musings, the reef wall itself, which runs along the eastern end of the site, has plenty of overhangs for you to investigate and several small caves, all in the 5 to 6 metre range. Clam Gardens rewards those who dive at a nice, slow pace. It would be easy to rush by and miss the amazingly colourful nudibranchs on the bommies, or to miss turtles resting in an overhang under one of the larger bommies, or even just a sleeping parrotfish in its protective bubble. The large fields of staghorn coral act as nurseries for a diverse range of marine life with a gently sloping sandy bottom being home to great numbers of garden eels. You will undoubtedly have enough time to play with the garden eels if you wish. Drop down quietly onto the floor and watch as they slowly stretch out further and further into the water column. Then when you move up or exhale too loudly they nervously retract into the safety of their burrows. The schooling action, which includes bumpheaded parrot fish, out in the deeper water at Clam Gardens, can be very entertaining, so when you are working your way around the various bommies remember to keep an eye out in the blue. There are 3 permanent moorings at Cod Hole and you will drop into the water, descending down a line to about 15m depth. You can start the dive looking for the elusive, lacey scorpionfish on some of the coral heads below the boat. After this you will proceed north east along a series of long narrow coral ridges, known locally as the Supermarket Aisles. 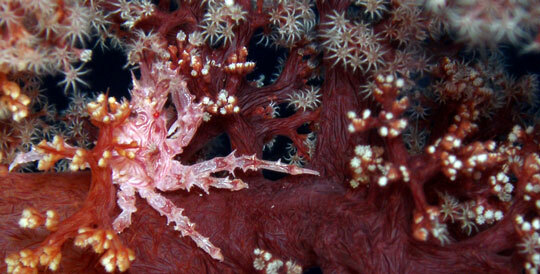 Around 32 metres depth you can find gorgonians playing host to some delightful pygmy seahorses. After exploring the Supermarket Aisles you will find yourself in a large sandy area where sharks and other pelagics aggregate, since this part of the Great Barrier Reef is open to the ocean. The effects of waves and currents mean this section of Cod Hole has plenty of caverns and swim-throughs to keep you entertained. 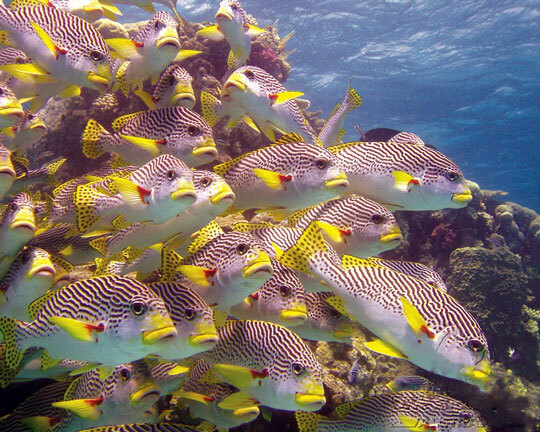 Moving back onto the reef will bring you into contact with many varieties of sweetlips including harlequin, diagonal-banded, as well as trumpetfish and flutemouths. Dash-dot goatfish rummage with their barbels in the sand as you make you way to the flat lagoon in 6 to 10 metres. Here you can have fun spotting nudibranchs and gobies as you drain your tank on the exploratory dive. 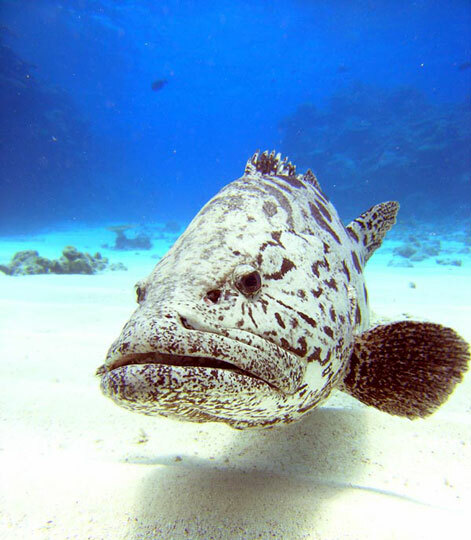 Cod Hole is naturally a dive site which is home to large potato cod (Queensland grouper). They can be up to 2 metres in length and have large powerful bodies. Cairns dive operators need a fish feeding licence to undertake the cod feed and these are only given to 'Advanced Eco-tourism' operators who have to undertake other reef health monitoring activities in return. Unlike, Osprey Reef this is part of the GBRMPA so everything is regulated, from the participants to the amount of food, to the steps of the process. The cod associate the sound of the liveaboard engines with food and it's normal to have a few fish of up to 60 kg waiting for the snacks they know the dive guides bring. A bit of a frenzy ensues as the groupers barrel in to make sure that they get their share of the bounty. Even divers that do not have food on them will find the more experienced cod nudging them in the hope of a secret stash in BCD pockets. It's not just the groupers though that go onto a mini feeding frenzy. You can expect to see coral trout, sweetlips, triggerfish and trevally all try and get in on the action at Cod Hole. Although the cod-feed is the main reason for visiting the site, it's not to say that it does not have other attractions. The sandy bottom has the occasional giant clam that can grow to almost 2m, and the bommies themselves are home to a rich diversity of marine life and colorful corals. Normally you will dive this site in a normal manner first, before then joining in the feed that brings in the big star of the show (although not all the Cairns liveaboards conduct feeds). If your bottom time permits it, it is worth heading north a little to Shark Alley. Although not guaranteed, over the years this has been an excellent place to spot cruising white tips plus the odd Maori wrasse. With the opportunity to get rubbed up by cod big enough to ride home on and coming face to face with a host of other usually shy and unapproachable fish, Cod Hole definitely lives up to its reputation. It warrants a serious visit, without which no scuba diving trip to the Great Barrier Reef is complete. You can make your way along the deeper sections with the reef on your right shoulder and look in the sand for some small but interesting sights such as shrimp-goby partnerships, nudibranchs such as the lined Nembrotha, and flat worms. There are a number of patches of coral dotted throughout the sand and you are likely to cruise over some tangled branches of healthy staghorns. 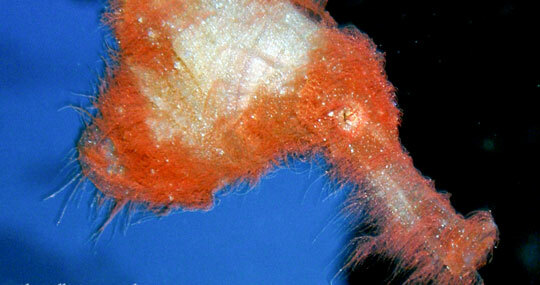 Keep an eye out for coral shrimp living on whip corals. Their perfect camouflage makes them difficult to spot unless they move but they are great fun to find. Take time to investigate the Dendronephthya soft corals and you might find the expertly camouflaged coral crabs, Holophyrus oatesii. As you begin to make your way into shallow water, the wall steepens and soon its features begin to reveal themselves to you. All along the wall there are crevices and caves where the floor often dances in shafts of sunlight beaming down from above. Several of these are wide enough for scuba divers to explore. Others offer a wide, inviting entrance only to force you into some reverse finning once you realise the walls are closing in. Pixies Caves enjoys a fair amount of fish life, particularly a little away from the wall and from the caves. 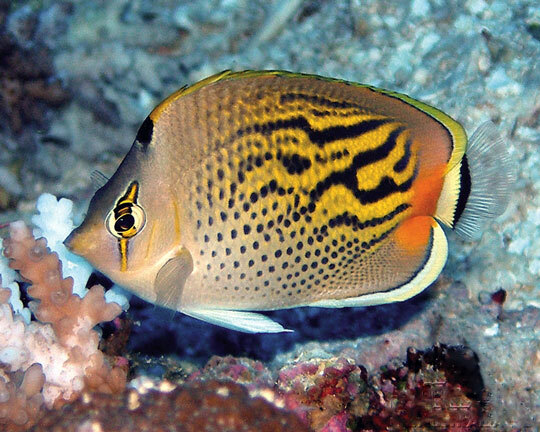 You can expect to see surgeonfish, rabbitfish and damsels all making their way around the reef. 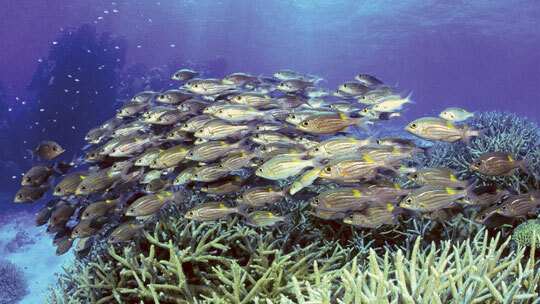 Also, schools of fusiliers dash around and larger reef fish such as grunts lurk in the deeper sections. However, the abiding memory you will have of diving this site is the labyrinth of illuminated caves and chimneys dancing in the sunlight. 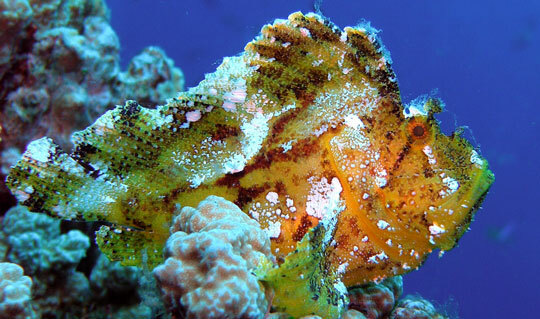 The main attractions of Pixie Gardens are the resident leafy scorpion fish. These only grow to about 10cm and are true masters of disguise. Their camouflage is so good, you could be looking right at one and still not notice them. Their compressed bodies can range from white through pink and reds to green. The best spot to catch a glimpse of one of these illusive creatures is the smaller bommie located behind the bigger bommie that you will encounter when heading north along the wall starting from the bottom of the mooring line. Up to 3 leafy scorpion fish can be found on the bommie at one time. Not a very deep dive site, Pixie Gardens' best bommies are located at 15m or shallower. The bommies all have many nooks and crannies well worth investigating for the treasures of marine critters they harbour. There are also a few gullies and canyons leading from the sandy floor up into the main reef, and these are worth exploring for the marine life to be found in them. You start your dive by descending to the base of the pinnacle and slowly work your way back in an upward spiral. The base always warrants a look across the sandy bottom as on occasion a cruising white tip reef shark and ray can be spotted. Keep an eye on the blue on the way up, as schooling fusiliers, trevally, barracudas, batfish and mackerel are a likely sight. Various types of shrimps, nudibranchs and pipefish inhabit Pixie Pinnacle and, with numerous overhangs with lots of dark little nooks and crannies, a torch, even on day dives, is a "must have" accessory. In one crevice there lives an electric clam and your guides may leave a torch at the spot for you to peer in and see this marvel at work. Do look out for stonefish resident on the pinnacle and remember to watch where you put your hands when you're looking for interesting critters. As you slowly wind your way up this chimney, there are all sorts of interesting sights to keep any eye out for. Sunshine coral with delightful little crystal shrimps, and anemones with spinecheek or orangefin anemonefish, make great photographic subjects, as does the occasional sluggish flowery cod. Pixie Pinnacle is home to large quantities of fairy basslets, so much so that it seems as if a pink cloud envelopes the pinnacle at some points, making pictures of other critters difficult to take. Rounding one bend, you will soon see a riot of colouful fish hanging in the current. Blue dash fusiliers, fairy basslets, anthias and more all enjoying the bounty of food swept through by the Coral Sea current. Enjoying the smaller fish of the Great Barrier Reef are red bass and particularly trevallies that swoop around at break-neck speed to gobble up the least fortunate. 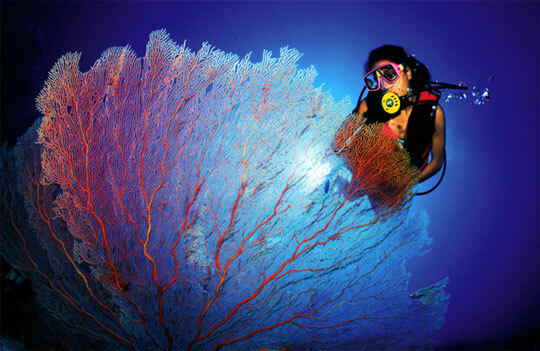 Towards the top of the pinnacle, hard and soft coral cover is outstanding and includes black coral. Gorgonian fans, sponges, lace coral and yellow turret coral are all represented and in pristine condition. 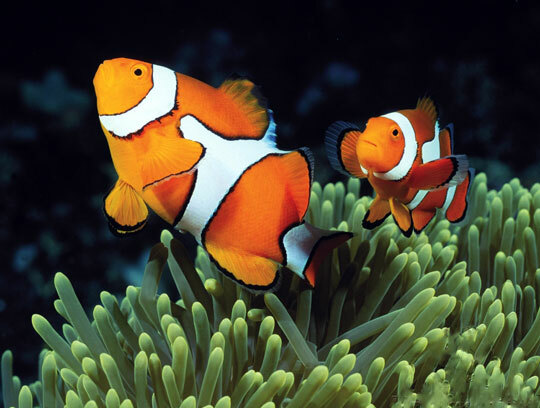 Anemones, occupied by resident clownfish, are ever present, with a keener eye required to spot cohabiting prawns and crabs. In many places, moray eels can be seen peering out from their lairs, as well as hunting lion fish and resting peacock groupers. Located to the south west of Ribbon Reef #3's south end, Steve's Bommie is an isolated pinnacle that rises from 30m to just 5m below the surface. It is home to a huge amount of diverse marine life with large numbers of trevally, snappers, goat fish and fusiliers, a common sight in the blue around the pinnacle. 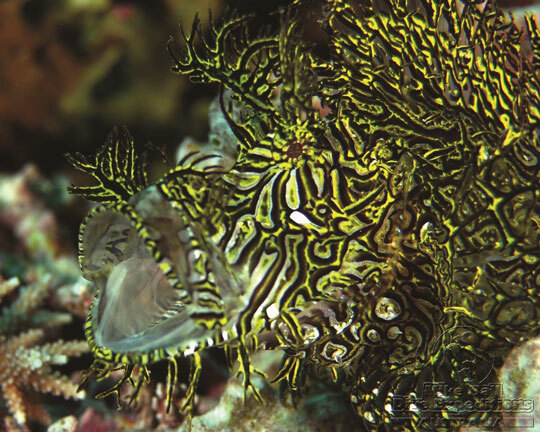 The pinnacle itself is heaven for macro divers with an abundance of nudibranchs and pipefish. Your dive plan will start off with a descent to the base of the pinnacle at 25m, where Steve's memorial plaque is located. Wobbegongs are also worth looking out for on this Great Barrier Reef site, lying motionless and camouflaged as ambush predators do. This makes them hard to spot but they are a great find when you do. A winding path around the pinnacle will then slowly lead you back up to the surface. Rising up around bommie, look in the cracks and crevices for different types of pipefish: Shultz's pipefish, banded messmate pipefish and glittering pipefish. The multitude nudis, flatforms and other critters are so captivating that you'll often forget to keep an eye on the blue. Not only is the schooling action constant, but cruising barracudas, whitetip reef sharks and seasonal minke whales will have you not knowing where to look first. Of coral Steve's Bommie has plenty, with outstanding growth of both hard and soft varieties. Boulder coral, gorgonian fans and plate coral are in abundance. 5 different species of Australian anemonefish inhabit the bommie along with huge amounts of purple and gold anthias. In fact, there's so much to see on the bommie that some guides mark certain areas of interest with glow-sticks (which they retrieve later), to ensure you get to see all the weird and unusual life, making Steve's Bommie a memorable experience. A normal dive on the Temple of Doom will have you descend to the bottom of the bommie and, having made your descent, you slowly circle around the bommie on the way up. It's worth spending almost as much of your time looking out into the blue as it is looking at the bommie itself, due to the sheer amount of pelagic action that the Temple of Doom draws. It's not unusual to see sharks cruising past or large rays out over the sand. You will also see large numbers of bluefin trevally up to 70 cm in length, schooling just off the bommie. Smaller schools of fusiliers and Moorish idols also often appear. As you progress up the bommie there are a few overhangs at the 15 to 20 metre depth range, which are favourite spots for turtles. If you haven't already seen them foraging for food on the bommie, this would be a good place to look. There are plenty of anemones on the bommie with resident anemonefish, Moorish idols and redtail butterflyfish, which always makes for great photos, especially with a backdrop as picturesque as the Temple of Doom. Surgeonfish abound on the bommie and you can often see trumpetfish hunting their prey. Batfish, either singly or in schools, are plentiful and always seem to oblige divers by pausing to have their photo taken. It's worth getting close in to the bommie too, as the Temple of Doom is one of those sites that rewards those with a good eye. The nooks and crannies are good for various nudibranchs and other macro critters. 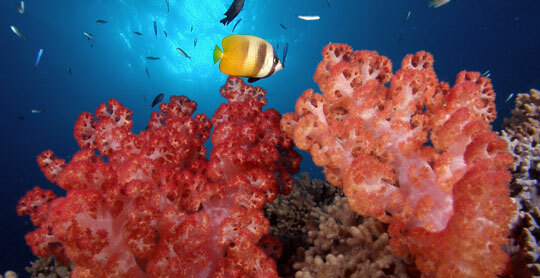 The Ribbon Reefs and Cod Hole are only found north of Cairns where the best diving in the area is to be found. 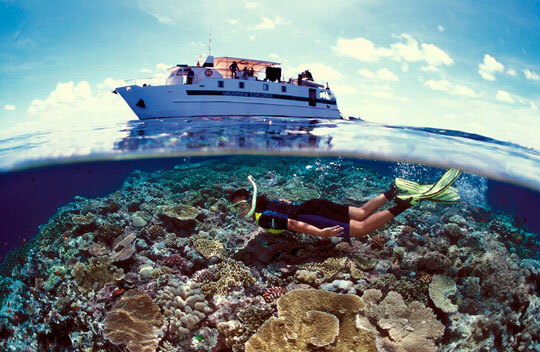 As such a liveaboard is the only option from which to reach this area and enjoy diving on the Great Barrier Reef here. Dive The World will help you select the liveaboard that's right for you, so start off by checking out our Ribbon Reefs liveaboard section. 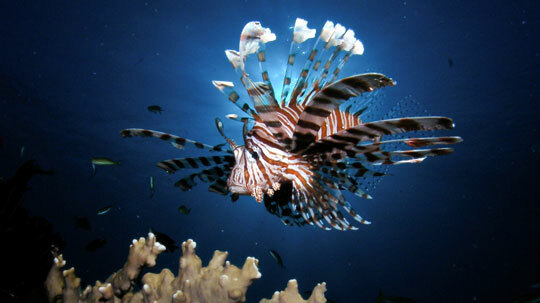 Liveaboard trips to the Ribbon Reefs and Osprey Reef are very popular and fill up quickly. So we recommend booking well in advance. 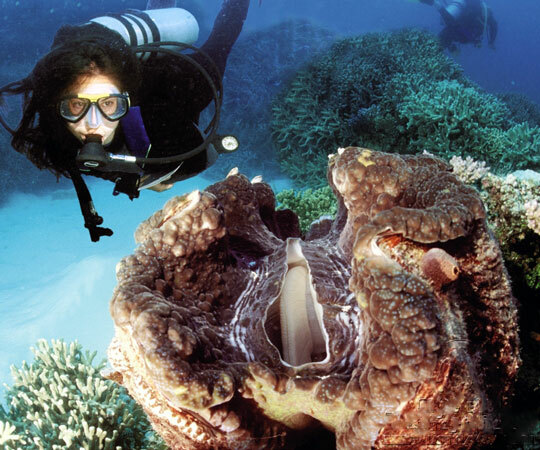 Due to Queensland's tropical climate, any time of the year is a good time to dive the Ribbon Reefs. Water temperatures fluctuate between 22°C in winter and 29°C during summer. Thanks to the absence of human activity in the area, visibility is good year round, with best vis from September to November. During the wet summer months rainfall is moderate but usually limited to early mornings and later afternoons. The dry winter months see little rain. December to February are the rainiest months although the rainfall is often confined to night time. Surface conditions are most often calm but can become moderately rough during winter, although in and around the reefs there is plenty of shelter from the ocean swell. 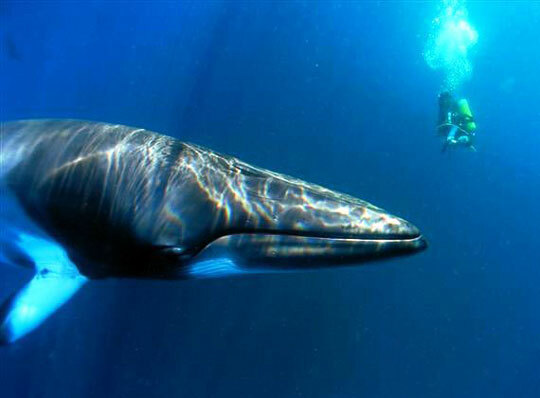 In the winter months of June and July, dozens of dwarf minke whales can be seen on their migratory path around the Ribbon Reefs. 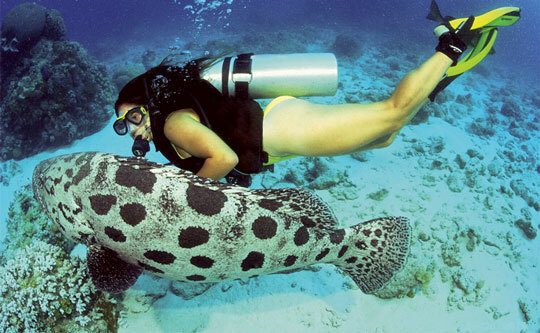 The famous giant potato grouper are present at Cod Hole all year round. Where are the Ribbon Reefs and How Do I Get There? Review our maps below of Great Barrier Reef, showing the location of the Ribbon Reefs, and their host country Australia. Here, you will find information on how to get to the Great Barrier Reef.